US church leaders are to ask Prime Minister Tony Blair to work for the non-violent replacement of President Saddam Hussein. 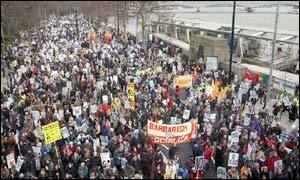 They challenge Mr Blair's claim that there is a strong moral case for toppling the Iraqi leader by force. They say the US is barely using its powers to support opposition groups within Iraq. The leaders are due to meet Mr Blair on 18 February. The delegation is headed by the Reverend Jim Wallis of the Sojourners' Community, a Christian justice and peace group based in Washington DC. It will tell Mr Blair a non-violent strategy for removing Saddam Hussein could work if it had Western backing. Civilians, they say, could cause disruption around Iraq, dispersed enough to avoid offering convenient targets for repression. The realisation that open opposition had begun would embolden other Iraqis to take part in "more systematic acts of resistance". This growing opposition would offer dissidents within the regime a place to which they could defect. The US delegation says non-violent resistance has historically relied on weapons like strikes, boycotts, civil disobedience and even non-violent sabotage. Its hopes of success rest partly on the assumption that an authoritarian ruler requires services from the population, which he cannot indefinitely compel them to supply. The church leaders say the Iraqi regime is particularly vulnerable over oil - if a limited number of civilian oil workers downed tools they could create a crisis by themselves. They believe Iraq is ripe for non-violent change because millions of Iraqis detest Saddam Hussein, whose hold on power in any case relies on personal loyalties and repression. A few years ago, in the city of Karbala, they say, civilians effectively encircled troops sent to control them, and similar uprisings on a national scale could stretch the regime's machinery of repression to breaking point. Crucially, the US delegation will tell Mr Blair the West is failing to give Iraqi dissidents the support they need - the other condition they need for success. Under the Iraq Liberation Act of 1998, they say, the US administration can give opposition groups goods and services - including training - worth up to $97 million. So far it has used $1m of that total. It will tell Mr Blair the choice is not between leaving Saddam Hussein in power and removing him through war, but that there is a third way. Dan Plesch, of the UK's Royal United Services Institute, told BBC News Online: "What the delegation is pointing out is something very embarrassing, that the US is not interested in trying for peaceful change, but only in something more squalid and traditional. "It's quite remarkable that despite all the rhetoric President Bush and Mr Blair have refrained from indicting Saddam Hussein for war crimes. "The delegation's approach is certainly worth trying."